Boxers make excellent family dogs that enjoy being active with human companions. 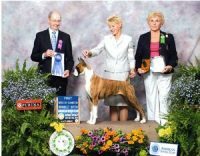 This breed performs well at dog shows after receiving proper training. Many boxers are trained to become service dogs for people with physical and intellectual disabilities. Like any dog, boxers will need house, leash, and obedience training. 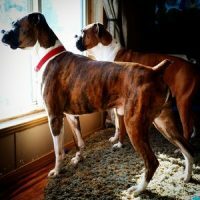 Learn more about boxer training to discover how you can help your dog transition into a new home. It’s important to train boxers when they are puppies to ensure they grow up to be obedient adult dogs. Boxers can be a stubborn breed and often have a mind of their own. This highly energic breed requires daily exercise. 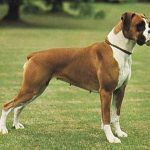 Boxers are known to be jumpers, but this breed learns obedience commands very well. Harsh discipline is not recommended for this breed. Boxers respond well to positive and reward based training methods. Professional trainers use praise, encouragement, and repetition to help boxers become obedient dogs. Pet Owners can easily train their boxer by practicing patience and positive reinforcement. A dog cannot be house trained overnight. Harsh training methods might cause your boxer to become frustrated and confused. It’s important to put your boxer on a consistent feeding schedule. Removing food between meals can help prevent accidents and weight gain. It might be necessary to visit a veterinarian or change your dog food if frequent urination becomes a problem. Responsible pet ownership can prevent your dog from having accidents in the house. Boxers should be taken outside at least 4 times a day. It’s especially important to take your dog outside in the morning and later in the evening. It’s helpful to look for signs that your dog needs to go outside such as barking, pacing, or scratching the door. Crating is one of the best ways to house train your boxer. Although the concept might seem cruel, it will teach your dog to only urinate outside. Many pet owners crate their dog when no one is home to supervise the animal. A crate should be large enough for the dog to lay down, but small enough to prevent the dog from urinating in another area. Pet owners should avoid certain training techniques and behaviors. Proper box training discourages yelling, hitting, and rubbing your dog’s nose in waste. Although crating is a good house training technique, crate time should be limited. People should use pet cleaners instead of ammonia-based cleaners. It’s also a good idea to let your boxer enjoy being outdoors after urinating with a walk or game of fetch. Leash training your dog is necessary for walks and trips to the veterinarian. An untrained dog will frequently jump and pull on a leash. 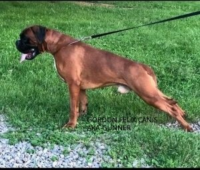 No-pull harnesses, head halters, and positive reinforcement are effective techniques of boxer training. A no-pull harness is an excellent way to teach your boxer not to pull on a leash. Another great leash training technique is putting a head halter over a dog’s snout. The halter will turn the dog’s head down and sideways when it pulls on the leash. The “penalty yard” method is another technique used to leash train your dog. Professional trainers recommend stopping and backing up three feet when a dog pulls on the leash. Pet owners should not allow the dog to walk forward until the leash becomes loose. It’s important to use positive reinforcement when leash training your boxer. Pet owners should praise their dog by telling them they are doing a good job. Giving your dog treats during walks is another positive reinforcement technique. It’s best to avoid giving a treat immediately after the leash is released. Treats should be given randomly throughout the walk. 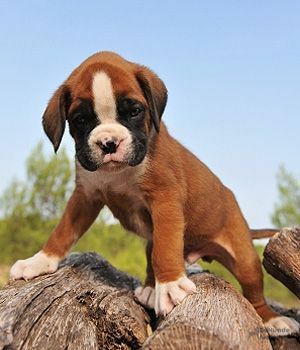 Boxers are wonderful companions that can be easily trained with patience and positive reinforcement. It’s essential to begin boxer training as soon as possible. Crating is one of the best ways to house train your dog. No-pull harnesses and head halters can be useful leash training techniques. It’s also important to use positive reinforcement and avoid harsh discipline. The mini boxer is a hybrid dog. Hybrid dogs are created when two purebred canines, from different groups or classes, breed to create a new standard with positive characteristic from both lines. 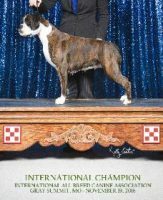 This mini line is a cross between the American boston terrier, which has been around for 125 years, and the boxer, originally from Germany. 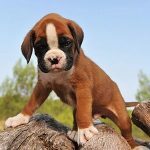 The temperament of the mini boxer is kind, gentle, and fun loving, and they can be loyal and even-tempered when raised around children. The bred in non-aggressive and prefers the company of humans. If not socialized with other dogs, cats, and people, most canines, this one included, will be skeptical of strangers and will not easily tolerate other pets. Full grown, they can weigh 25 to 30 pounds. Some dogs have been reported upwards of 50 pounds or slightly more, and breeders believe that is the boxer gene coming out. Even though labeled as miniature, they are considered medium size when compared to other breeds. A nice feature of these mini dogs is they can adapt to many environments. These pups do well in apartments with easy access to the outdoors, suburban living, and ranches with room to roam. The activity requirements are average, meaning they do not need constant motion like border collies, but they need more exercise than a Pekingese or a Shih Tzu; daily walks around the block or playtime with the family are often enough. You will know if your miniature is getting enough exercise because these pups will become mischievous if left to burn off their own energy. 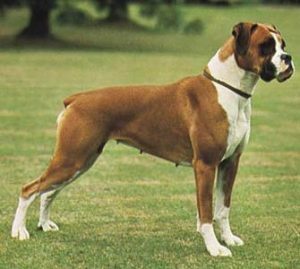 Their physical features are very similar to the standard boxer. The fur is short, smooth, and easy to maintain. This shorter fur is low shedding and usually can be kept clean with a bath every four to six weeks along with weekly brushings. During warmers months, you will want to brush more often. In the colder seasons, do not leave this short coated dog outside. In any outdoor condition, make sure your dog has proper shelter or protection, and plenty of water. There is a variety of coat colors: black, tan or brown, red or sable, silver, and white or cream. Most of these dogs will have a light colored streak, strip, or blaze down the face and chest, and the nose and eyes are dark brown or black. Mini boxer’s ears fold down. Floppy ears should be inspected and wiped out weekly to prevent build up and infections. For a quick clean out, moisten gauze or a clean washcloth with ear cleaning solution and gently swab out the inside canal. Never use cotton swabs in your dog’s ear; these can penetrate the eardrum. Active dog’s toenails will naturally stay short, but young puppies or older dogs will need occasional trimming. This breed’s nails can be black, white, or a combination of both. When trimming the nails you do not want to cut past the blood vessel, which is easy to spot on white nails. If there are any black nails on the pup, trim a small portion off at each sitting. If you accidentally cut the blood vessel, it will bleed. You can stop the bleeding with commercial cauterizing power. 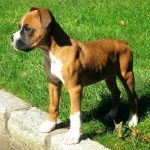 Starting training your miniature boxer to tolerate baths, ear cleanings, and toenail trimmings as a puppy, so you will not have to struggle with them when they are full-grown. 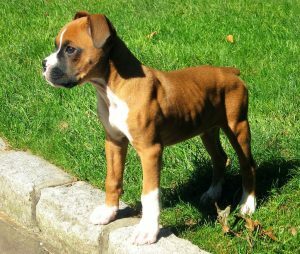 Mini boxers can have a lifespan of 12 to 15 years if relatively healthy. 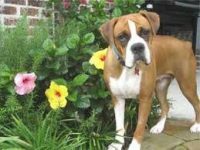 Some health concerns passed on by the boxer breed are hypothyroidism, which once diagnosed can be treated with medication, joint and hip problems, and heart issues, such as cardiomyopathy. Boston Terriers are prone to skin disorders, eye problems, epilepsy, and heart issues. The best practice is to monitor your pet’s health from the beginning by getting annual checkups at your veterinary clinic. The hybrid mini boxer adapts well to city or country life and is relatively low maintenance when it comes to grooming and handling. They are generally healthy with a few possible inherit issues, and possess the qualities of a playful, friendly, and devoted companion.